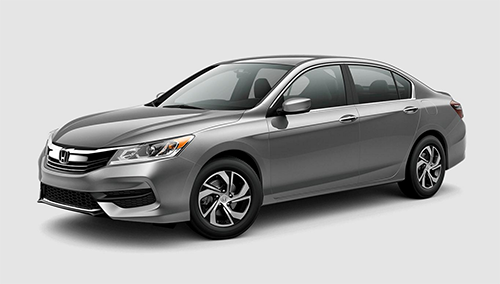 Here at Brilliance Honda of Crystal Lake, just a short drive from Elgin, IL, we’re happy to bring you the latest Honda Accord Sedan. The Accord LX trim is the most affordable version of this famously reliable midsize sedan. If you’re looking for a model that combines efficiency, technology, and style with an affordable price point, then you should consider the Accord LX. The base Accord Sedan LX doesn’t skimp on performance. It gets a 2.4L four-cylinder engine good for 185 hp and 181 lb-ft of torque. Transmission options include both a six-speed manual and a continuously variable transmission. When equipped with the CVT, the Accord LX is rated at up to 27 mpg city/36 mpg highway by the EPA, putting it near the top of its class when it comes to efficiency. Honda always puts safety first. That’s why the Honda Accord Sedan LX includes features like a rearview camera, multiple airbags, traction and stability control, and anti-lock brakes. You can find the latest 2017 Honda Accord here at Brilliance Honda of Crystal Lake today. We’re happy to help you understand all the different trim levels so you can pick out the one that best suits your needs. You can also contact Brilliance Honda online now with any questions!